Imagine a vast plain covered in lush vegetation and abounding with wildlife. Not just any wildlife but animals such as sabre-toothed cats , three-toed horses, wolverines, and even bears. 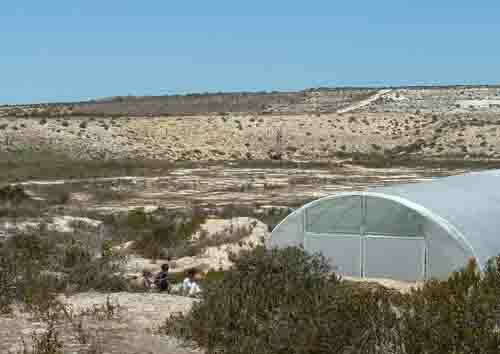 Five million years ago these were the animals that roamed the plains in the Langebaan area. Today the picture is completely different, the land is dry, flat and barren. Here and there you will find the odd tree but for the rest its short grass which at present is very dry and dusty. It was in this dry and barren land that miners from a local phosphate mine discovered old bones when they moved the earth to get to the phosphates. When the bones were shown to palaentologists they knew that they had discovered something out of the ordinary. Carbon dating showed that the fossiled bones were in fact about 5 million years old. The discovery led to further research in the area and on following the lines of the ancient river a site surrounded by some large rocks was pinpointed. The site was divided up into metre squares as is done on any archaelogical dig and the digging began. Soon some major discoveries were made and the wider the dig extended the more they found. It is presumed that five million years ago there was a drought and that many animals congregated around a waterhole that was left in the river bed. Suddenly it started to rain causing a flash flood in which many animals in their weakened states were caught. The rushing water dragged them into the water hole where they died and were trapped for ever. 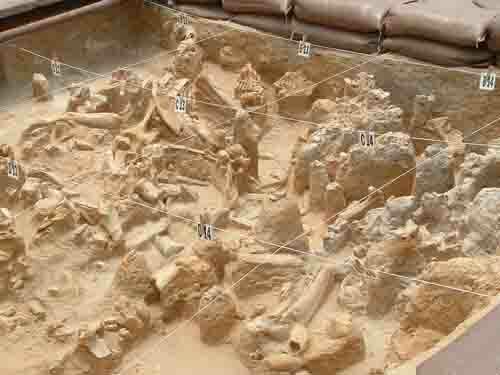 Over the years dust and mud covered the remains of the carcasses and fossilised them. In 1993 when phosphate mining in the area ceased the SA Museum took over the area and started preserving it for posterity. The dig with most of the bones still in place. The dig has been opened up for people to visit and see for themselves what an archaelogical dig looks like. The bones scattered in the dig vary from African bears to three toed horses to sabre toothed cats and ancient antelope. 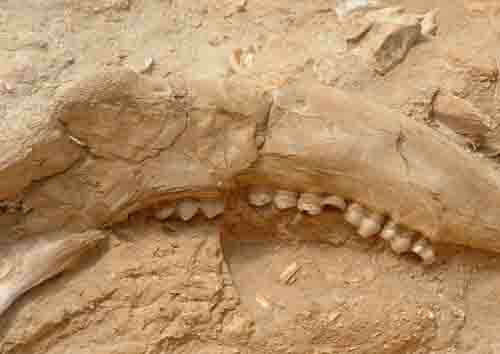 A fossilsed piece of a seal's jaw bone has also been found in the dig. It's quite amazing as the dig is about thirty kilometres inland from the sea. Visiting this dry arid part of the country is a must for those who enjoy ancient things. A piece of rock found on the shore of the Langebaan lagoon could quite easily turn out to be an ancient stone aged tool or the bones of some ancient creature that lived there millions of years ago. Footprints of a young woman dated at about a 170000 years of age were recently found on the edge of the lagoon. Interested in discovering some of our timeless history for yourself. Visit Cape Town and the West Coast.